Sept. 19, 1941: Valverda Booth visits her husband, Ernest Booth, while he is in custody in the Silver Lake Hammer Murder of heiress Florence Stricker. Is there anything more delightful to the heart of a research drudge than a notice from the Los Angeles Public Library that a book is available for pickup? Not this time, anyway. 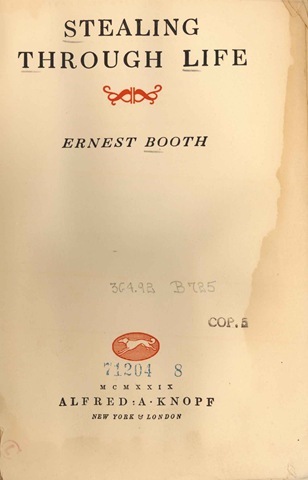 The book that zipped to the top of my Zombie Reading List is “Stealing Through Life,” the utterly forgotten autobiography of a completely forgotten fellow named Ernest Booth, who was held as a suspect in the Silver Lake Hammer Murder of Florence Stricker. The battered copy, with crumbling pages, arrived at the local branch, and I’m making my way through it. Judging by the initial news coverage of the killing, it was hard to see why detectives charged Booth. Granted, he had a somewhat fishy story about his actions on the day of the killing. (He supposedly met with Stricker’s husband, George, an osteopath, in the morning to discuss a medical story he was writing.) But at first glance, it seemed that Booth was nothing more than a somewhat colorful, smalltime ex-con who had turned his time behind bars into a career writing prison pictures and generally floating on the fringes of Hollywood. A little further digging revealed that the story is a more complicated than I expected. In fact, if I had any sense, I would put this on the back burner until I wrapped up the Zoot Suit Riots – but it’s a bit late for that. One interesting question hasn’t been addressed yet, and that’s how Booth managed to publish this book while he was in prison. Corrections officials usually forbid such things – recall that Caryl Chessman’s books were smuggled out of San Quentin and only part of Times bomber J.B. McNamara’s autobiography survives because the rest was seized by authorities. This book was written with the idea of showing several years of a so-called hardened criminal’s life. I have tried not to play favourites in presenting any characters. If some names be obviously changed, or localities left vague, the change does not detract from the scene, and they are better thus. However, many portions of it could and do fit one section of the country as readily as another–like the parts in which they are laid. If the book scorches a few official whiskers, it also strips from various thieves the romantic glamour which fiction has glossed over them. I have sought to present no glibly connected story, for the obvious reason that such a story must contain many elements that are lacking in life, as it is lived. Certain people who appear for a brief space, and then are dropped from the further progress of the action, have been dropped because they had contributed their portions–they had been exhausted. And in the same manner some actions do not seem complete–because actions are like that. If the book starts on a plane rather different from the usual “prison” story, and then descends to a lower, less pleasant plane, I attempt no excuse other than that it is so written because it was so lived. The usual manner of presenting this class of material is to end the book with its embracing a ready-made salvation, or protesting that author has been reformed! I maintain that any young man or young woman living through such experiences most certainly is reformed–almost with each passing moment. In all the prison fiction I’ve read, the author seeks to impress upon the reader how terribly he has suffered, and that from that misery has risen a glorified “repentance,” a sort of throwback to some childish state wherein are contained all those fleeting joys which are promised to the righteous. But it seems to me that one does not go back. One progresses–either to chaos or to understanding. And when a man reaches that state of appreciation which enables him to see objectively the things which formerly were subjectively a part of him, then he has in truth been re-formed. But not into a model, nor into a representative of a group. The pages which follow constitute an effort to work out the fundamental causes which brought me to prison. I do not want to appear in the light of attempting to justify my present position. But if the so-called “crime-wave” is due to such criminals as I have met, both official and in the “underworld,” then to calm that wave and give to it the tranquility the reformers moan for is but a matter of intelligent application of simple changes which, I believe, are all too obvious. THERE are those of us–thieves and poets–who are born intact. Complete. The stern realities of life are inverted and become only so many evidences of unreality. Within ourselves we have a complete world of our imagination. This has been with us as far back as our conscious mind can take us. Within this realm of our own possession we retreat when confronted with things that do not fit into our preconceived scheme of things-as-they-should-be. And to us, those things that annoy and vex: being “normal,” doing as “other boys and girls do,” acting and conforming to others’ conception of what we should be–all these have no place in our life. We are the odd ones. The criminals, the geniuses, the builders of Utopias. The fact that I had no troubles bothered me. I was next to the youngest of a family of four boys; I had the most adorable mother that ever lived, and my father was comfortably situated, financially. There was, apparently, no reason for my leaving a pleasant home and the love and attention of parents who sought only to educate me, willingly to clothe and feed me, and to prepare me adequately for the time when I should have to win my own food and clothes. Is it a matter for wonder that, with this faculty early aroused and quickly developed, I became impervious to the efforts to fit me into the mould that was set for me–along with hundreds of others? I experienced a restless, growing dissatisfaction with the world in which I was living. People said things. The words told one story, the thoughts underlying them told another–vastly different. I disliked this pretence, this evasion of the true idea their minds held. Not prudish, or precocious, but–at that time–a sincerely honest craving for expression of real thoughts. Deep waters for a youngster ! Why, I’d always thought about these problems. He thought I was a child ! And he had said “it is best that we keep up this pretence of liking others. . . .” Why? Why was it best? Who said what was best, and who said what was not best? The idea of pretending to like someone–utter rot ! I would never pretend to like someone, and if it was only pretence that brought us together–I would not be with that person. Inevitably Buddy and I came together. He was a quiet, mild-tempered, blond lad, slender of build, hesitant of action, yet possessed of the same type of dreamer’s mind. He was about two years my senior, but smaller in size than I, and, as his folks were seldom sober long enough to know if he was attending school, he had not yet learned to read. Hours we spent together in the hills, in the attic of my home, in the loft of what had been a stable and coach barn, or on the rear portion of my home lot. Hours during which I read to him. Stumbling through the words that proved too long, changing others when the sentences stretched out too far; then discussing the story and its characters for days after, when we could not sneak up to one of our retreats. It was necessary to sneak up to them because of the disfavour in which Buddy was held by my parents. His family were from the wrong part of Ireland. And though Buddy was born in Oakland, just a few streets from where I had been born, it didn’t alter matters–he was persona non grata. That our common interest was welded by this opposition is indisputable. Our meetings took on the added zest of something accomplished despite opposition. The time together was doubly cherished because of this unexplained hostility towards him. If I had been given any reason as to why he and I should not associate, I should probably have considered it and debated with my parents, succeeding in winning them over in the end to liking Buddy. But I was told not to play with “that boy.” When I asked for reasons, I was informed that I had “been told”—did I have to be “told again”? Still–had I been told one hundred times, it would not have mattered ; Buddy was my pal. From speculating on adventures, we moved logically into putting into action what we had learned from our reading and discussions. The King of the Tramps finally showed how it was done. Presto! We donned overalls and sweaters over our suits; and though it was not considered good manners by the King to carry food, we decided that the mere fact that other tramps begged their food was sufficient justification for us to carry ours along with us. If they depended on haphazard supplies, we would be different and know an independence that they could not attain. Then, too, I was not so sure that we could get far enough into the country on the first “ramble” to take us beyond the houses that held the city-folk. Hence our flour-sack and the supply of groceries. I had obtained them at a grocery where my family had a charge account. My indiscriminate selection of food-stuffs probably aroused the clerk’s suspicion, for he telephoned my home and, luckily for me, my older brother answered. He told the clerk that my mother had no doubt sent me down, and that it was all right. A bit nervously I received the package, and Buddy and I departed. . . .
Five o’clock that evening found us near the train tracks of the station. We were tired and footsore. We had trekked from East Oakland, half-way around Lake Merritt, through a part of Piedmont–pausing frequently in vacant lots to fortify ourselves from the sack–and arrived at the Bay shore just as lights were beginning to wink on in houses and stores. The sharp fire of our enthusiasm had dwindled to a small, flickering flame. But this was in keeping with the misery that was to be ours, the misery and grief I had wanted to know. Buddy “guessed it was going to be cold.” I wondered how it would feel to be riding the top of a passenger train while the cold crept into my bones to chill and numb me so severely that I could just manage to hold on until the train reached a warm, well-lighted station. That I should be able to retain my hold until the warm station was reached I had no doubts. It had to be that way because I saw it thus. This entry was posted in 1927, 1929, 1941, Books and Authors, Cold Cases, Crime and Courts, Film, Hollywood, Homicide, LAPD, Libraries and tagged #prisons, #Silver Lake Hammer Murder, authors. Bookmark the permalink. I suspect the young Booth read A-No One’s earlier autobiography, “Life and adventures of A-no. 1, America’s most celebrated tramp,” and not the Jack London tie-in. @Crime Buddy! Since Ernesto didn’t use the correct title, I’m not really sure. Thanks for the link! I know you have a lot on your plate, but are you ever going to continue with the Silver Lake Hammer Murder story? I still don’t know who dunnit; did I miss something somewhere?